My apologies that my blog has been a little sleepy lately. March typically is not my crafty month. I'm not sure why. It could be that I don't really get into St. Patty's or that it is spring break and the kiddos are home or maybe it's just the nice weather and I'm much more inclined to be outside than behind a glue gun. There are other reasons too.... Anyway, it doesn't matter the reason, we all have our ebbs and flows. Recently I was asked to help with a service project for my church. We made flowers and head wraps for cancer patients. These flowers are not an original idea, they are EVERY WHERE in blogland. However, I have had a few people ask for the details on how I put mine together so I figured one more tutorial wouldn't hurt. 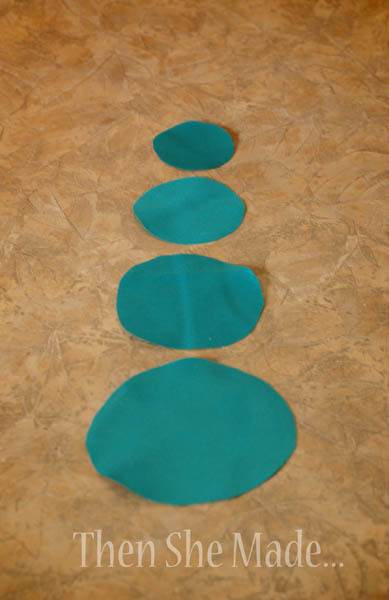 1- Start by cutting out 3 to 5 circles from a synthetic fabric (something that will melt like satin) You want them to be different sizes. I usually start by cutting my largest circle first and then cutting the next one a little smaller. Then the next one smaller than that, and so on. 2- (Not Shown in pictures) Next you need to take your circles and very carefully melt your edges. You can do this by holding the edge of your fabric NEAR - not in, the edge of lit candle. The heat from the flame will melt your fabric. As it melts, slowly turn your fabric circle so that the whole circle will eventually have melted edges. This will also seal the fabric so it won't fray. You'll notice that as the edges melt, the fabric will also start to curl inward which will make it look like a flower petal. Also, do this is a safe area. I put my candle right in my kitchen sink so it was not near anything flammable, plus I had water close buy if needed. Here are the circles after the edges have been melted. So, take your largest petal and turn it over. 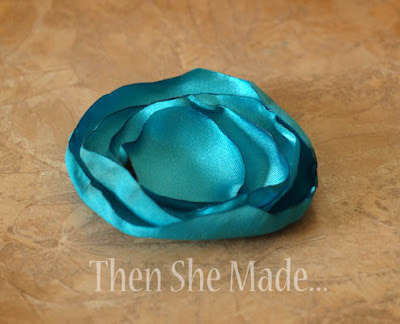 Place your felt circle in the center and sew it in place. I'm not a great sewer so I just did a quick stitch. (If you have a fear of needles, you could skip the sewing and just glue it in place.) Also, make sure your thread is fairly long. You'll need the extra thread for the next steps. 4- Now that your felt circle is in place, stack your other petal layers in place and bring needle up through the center of all the layers. 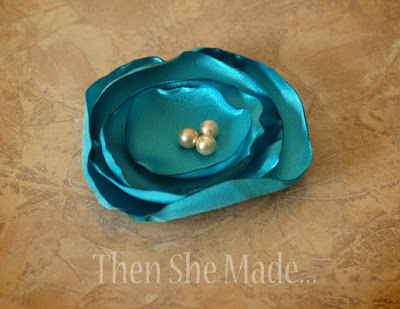 Now start sewing in your bead centers. The best way to anchor your beads tightly is to run the needle back down through all the layers and then come back up for the next bead. I usually like to add three beads but you can add as many as you'd like. After you've added all your beads, just run the needle back down to the back of the flower and tie a knot. 5- And last but not least, attach your clip or pin and you're done! You can sew the pin in place or use hot glue. Easy enough right? They make great hair accessories or even cute pins to attach to clothing. Tomorrow I'll share the other styles that we had on display. 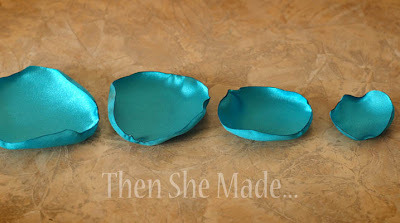 That is so cute and simle, I'll definitely have to try to make some! $ 1.20 + treats = CUTE!